WEPA (Wireless Everywhere Print Anywhere) is a wireless printing service that allows students to print documents at a WEPA kiosk from the web, USB drive, smartphone or any computer. To pay for printing, you will need to have sufficient funds in your Terrapin Express account to cover the cost of printing, which is currently $0.10 per black & white page, and $0.50 for color copies. Please use your UM Directory ID to logon to the system to print. There are three ways to print using a WEPA kiosk: (1) you can upload documents to the WEPA website, (2) print directly from a USB drive, or (3) print locally from a computer that has the WEPA drivers installed. Login at https://www.wepanow.com/ by selecting the University of Maryland and entering your directory ID and password. Click on Web Upload in the Shortcuts menu. Click Browse to locate the folder your computer where your files are stored. Select the file you want to print, then click Upload. 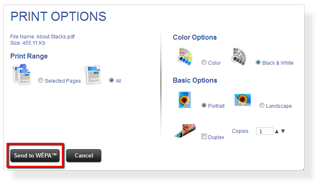 Adjust your options, including Print Range, Color Options and Basic Options, then click Send to WEPA. Your file will be uploaded to the WEPA server for printing at a WEPA station. You may now upload more documents, or logout. Go to a WEPA kiosk at your convenience and sign in with your WEPA account to print. Go to any WEPA kiosk. On the main screen, select Print from USB. Insert USB drive into the USB slot. Documents printed directly from a USB drive must be in either PDF or a Microsoft Office format (.doc, .xls, .ppt, etc.). With your document open, select File, then Print. Select options for black & white or color printing. Login to your WEPA account when prompted. Your print job will now be uploaded to the WEPA system. Go to a WEPA kiosk and sign in with your WEPA account. Login to the app using your UM Directory ID and password. Once you are logged in, you may send your print job from Dropbox or Google Drive to the WEPA cloud for printing from any WEPA station. Swipe your UMD ID at the WEPA kiosk in order to use your Terrapin Express account. You must have sufficient funds in your account in order to print. You may use a credit or debit card at the WEPA kiosk; however, there will be a $0.40 surcharge for all transactions. Drivers are software that allow your computer to recognize the WEPA printer. Note that when you install the driver, it will set WEPA as your default printer. WEPA kiosk print drivers are installed on VCL servers. To print to a kiosk from a VCL application, select either "WEPA-BW" or "WEPA-COLOR" from the print dialog and then follow the Local instructions.